* 129 | Pre-views, level help, tips and videos for ALL Facebook King levels! Level 129 – strategy tips! Level 129 demands the player to be careful and plan ahead. 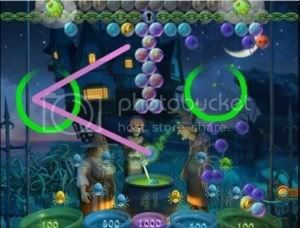 In the beginning of level 129 it is fatal to burst bubbles right above the cauldron. One do not want to have any bubbles under the chain to the left or right, when the chain unlocks, because there are infected bubbles above the chain, as I have a highlight on in the picture. Burst your way to the first lock Bubble as shown with green circles in the picture, then use angle shots to burst the Crystal Bubbles so you can unlock the chain. There is also an upper locked chain. Above the upper chain are two Bomb Bubbles that starts the countdown towards detonation as soon as the lock breaks.